It is Monday morning, and time to solve the weekly What Am I? puzzle. This next one comes from the film strip located on my cell phone camera. Good luck! 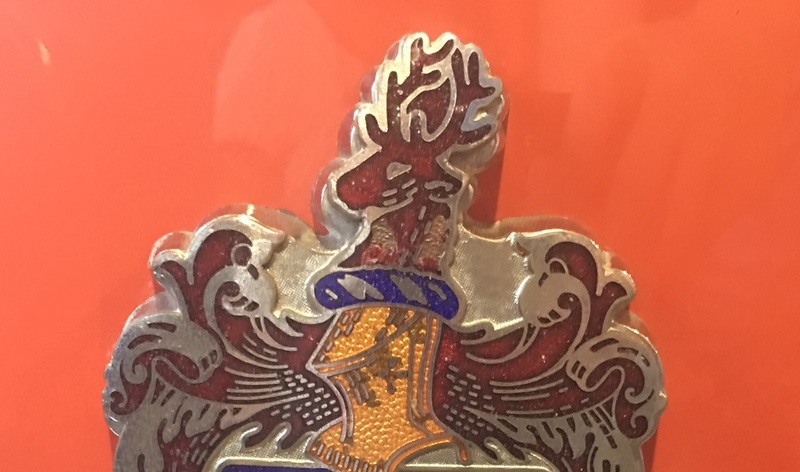 That looks very Broughambic...heraldic even. Definitely some sort of baroque crest from a chintzy '70s or '80s barge. First thing that pops into my head anyway. Seeing the antlers at the top I figured it was an early Buick logo but then I saw all those waves making me think DeSoto. I'm tapped out for lunch hour guesses. 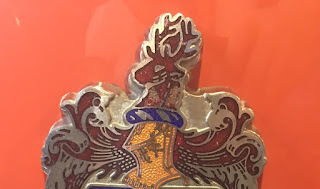 It is indeed the top of the Frazer Je Suis Pret logo -- and it was from a pic that I took of a 1949 Frazer Manhattan 4-door convertible at the Automobile Driving Museum this past weekend. I'm not sure that I should share this. My Dad told me this joke a long time ago. "Two guys just got discharged from the army. One guy says, "I've been saving my money, and I'm going to buy my girlfriend a car. I can't decide if I should get her a Kaiser and surprise her; or a Frazer and amaze her!". The other guy says, "why don't you get her a Tucker?". Thanks, Stan; I save everything. But I hoard jokes.